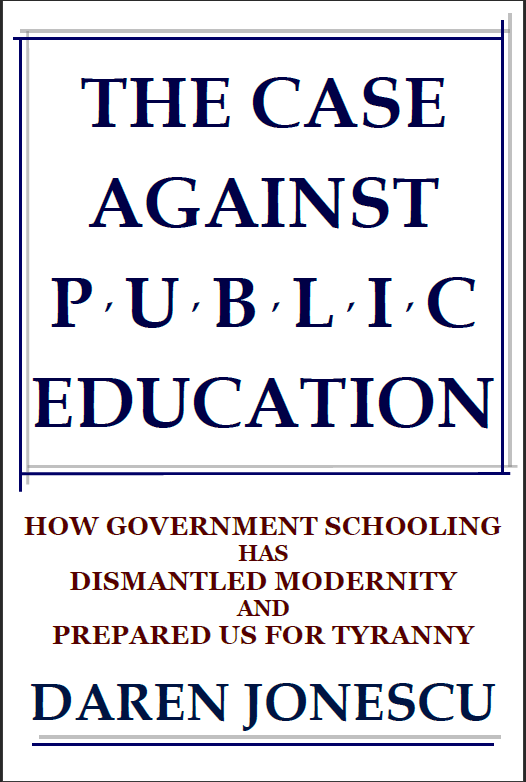 THE CASE AGAINST PUBLIC EDUCATION is now available in its entirety for FREE DOWNLOAD or ONLINE READING from this page. For more information about the book and why I am giving it away*, read here. To read the book, chapter by chapter, right here on the website, go to the Read Online page. To read my thoughts about digital books, e-readers, and the marketplace of ideas, click here. I’m no technician, so I cannot answer complicated computer questions, but if you are having trouble downloading the file in your desired format, feel free to let me know about it on the Contact Page. Perhaps you will be alerting me to a problem that can be repaired easily, potentially helping billions of other readers! * WORD TO THE UNWISE ON COPYRIGHT STATUS: “Free download” does not mean “uncopyrighted.” Intellectual property rights are not affected by price. You may acquire a copy of the book for free. (Or as many copies as you wish to download for your friends.) You may not reproduce or reprint the contents of the book in any form, or for any purpose, without written consent from the author. Usual exceptions for short excerpts in reviews or analysis apply, as per copyright laws.